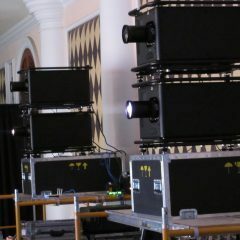 Allstar Sound offers projection technology for a wide variety of markets. The super silent DLP business projectors are highly suitable for use in meeting rooms, boardrooms, brainstorm rooms or break-out rooms. Our rugged large venue projectors offer excellent brightness for auditoriums, events, shows and projection mapping projects. For the digital cinema industry, we offer laser-illuminated and lamp-based cinema projectors, as well as postproduction projectors. Barco’s simulation projectors are the perfect fit for simulation and training, while our 3D stereoscopic projectors are the perfect choice for virtual reality.